The role of water in Troyes over the years : The marshy environs of Troyes provided the first settlers with the resources they needed for their provisional establishment. Augustobona Tricassium owes its existence to water. The Romans called it a castrum (fortified city) guarding the bridge of the via Agrippa, which ran from Milan to Boulogne-sur-Mer. The old city is located on an alluvial plain not far from the main river and a smaller river, the Vienne. Later, the city was protected by walls bordered by ditches. In the 12th century, there were at least four watermills in the city, fed by various canals, called rus. 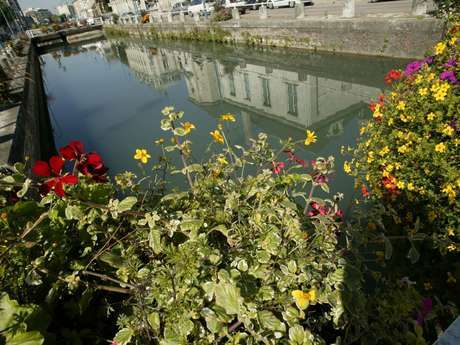 Drinking water supply was boosted by the Moline canal, a tributary of the Seine, which drained the marshes to the east, and by the Trévois canal to the south. The rus supplied water to the mills, shops, tanneries and clothing shops and served as sewers as well.Waterways also helped transport most of the goods and persons, and protected the city, whose houses were built mainly of wood and straw, against fire damage. Clean water was also vital for the health of the inhabitants, for drinking, cooking, washing and bathing and for supplying the laundry houses, washeries, public baths and steam rooms. Between the 15th and 19th centuries, apart from the many private wells, the city maintained at a large cost around 70 public wells. In 1805, Napoleon had the Haute-Seine canal and the Préfecture basin built near the ru Cordé in order to link the Bourgogne canal to Paris and promote goods traffic. In 1850, running water was installed in the city, the wells were closed down and many were destroyed because they impeded vehicular traffic. Most of the canals and the rus were filled in the 20th century and the Bains Douches(public baths) were replaced by the Vouldy swimming pool (piscine Lucien Zins). Today, Troyes is rebuilding its wells that you can see as you stroll through the bouchon. With their sculpted stone parapets and delicately worked iron, the new wells were built based on old plans and installed on the sites where the original wells used to be.